as soon as possible to see if the dates are available. but many times we have dates left open in between. to displayed in your community, please book early! 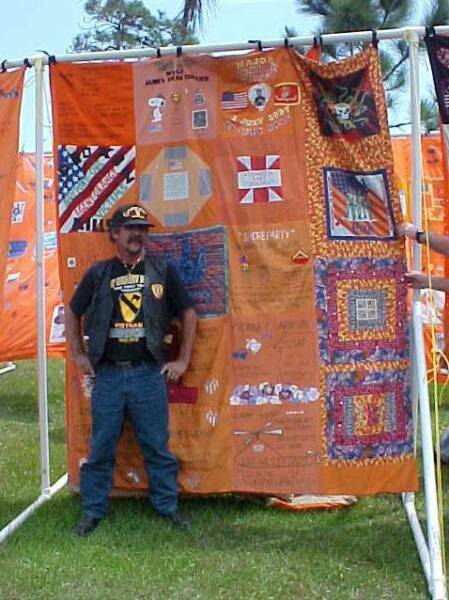 The Agent Orange Quilt of Tears to your area. 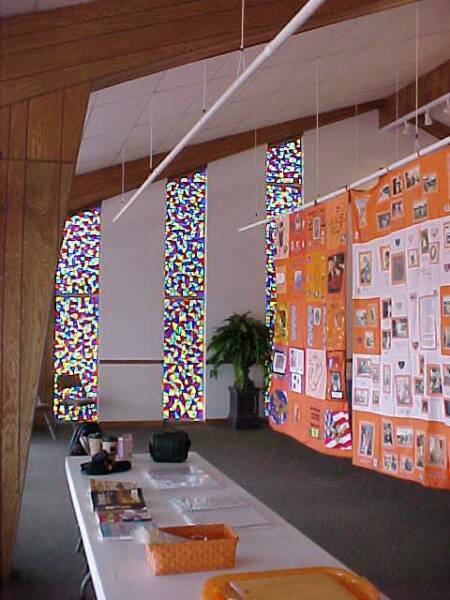 It is necessary for the host location to provide adequate means to display the quilts. there is enough room to walk completely around. Some form of lighting should be thought of if the display will be open after dark. rack system and equipment that we bring with us. We cannot bring our own equipment when flying. if you would like or need help with a display rack concept. It uses 1½ inch schedule 40 PVC pipe. We don't prefer this sort of outdoor display as it is not good on the Quilts. 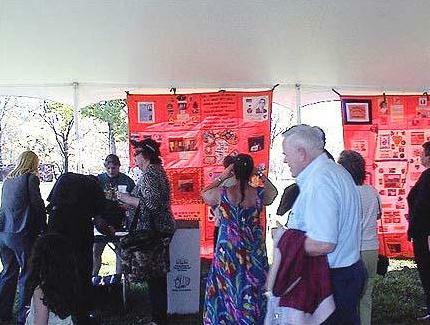 # 3 This particular tent was a huge party tent & where we were able to use the poles of the tent frame to hang the Quilts from. With this particular tent the sides were tall enough, some tents are not. 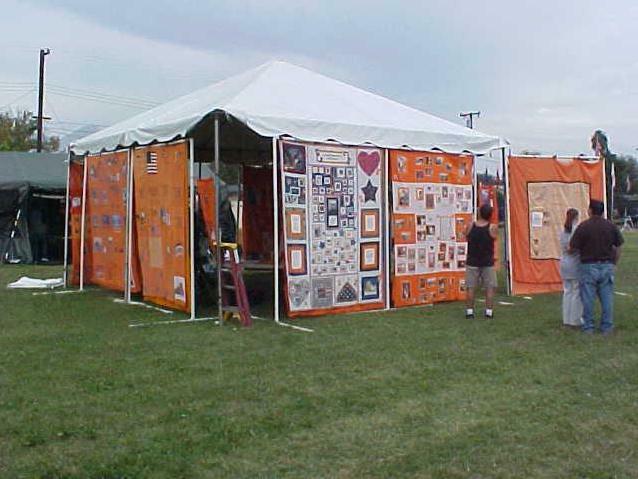 #4 This tent was tall enough but not large enough so we used parts of PVC rack to display some Quilts down the middle of the tent also. Tents like these in Pic #3 & #4 normally have flaps or outside walls available which is always a good thing to have readily available due to weather changes. which can sometimes save materials & space. 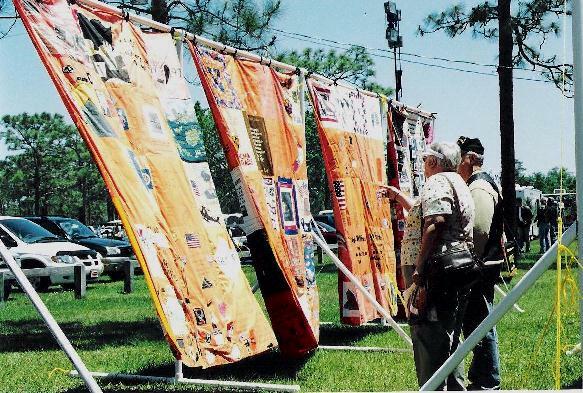 you to bring The Agent Orange Quilt Of Tears to your community. This way of displaying worked excellently! 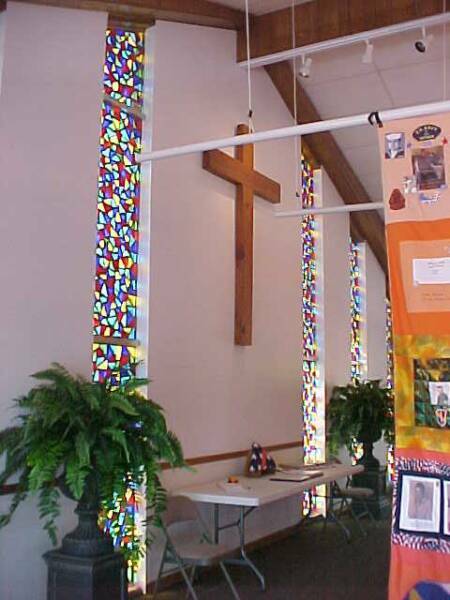 The Chapel had a drop ceiling & ropes were hung down from the framework in the ceiling. Pieces of PVC pipe was added & then leveled. 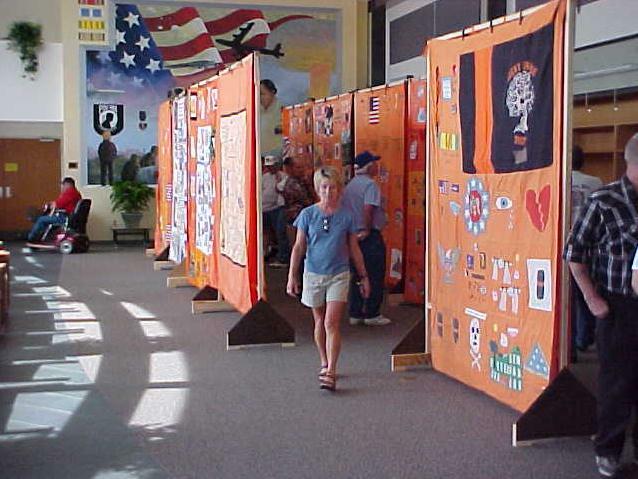 There was nothing in the walkways to create a trip hazard & here again we hung the Quilts back to back.